If you like funny, emotional novels that explore what happens after a family medical tragedy, you'll enjoy this. I loved it! My blog has been a bit quiet while I was putting all my energies into writing about my students for their report cards, but I'm back and looking forward to sharing more great middle grade reads with you on Middle Grade Mondays. Stay tuned! A new hilarious, honest, and hopeful novel from the author of Drums, Girls & Dangerous Pie! Claire’s life is a joke . . . but she’s not laughing. While her friends seem to be leaping forward, she’s dancing in the same place. The mean girls at school are living up to their mean name, and there’s a boy, Ryder, who’s just as bad, if not worse. And at home, nobody’s really listening to her—if anything, they seem to be more in on the joke than she is. Then into all of this (not-very-funny-to-Claire) comedy comes something intense and tragic—while her dad is talking to her at the kitchen table, he falls over with a medical emergency. Suddenly the joke has become very serious—and the only way Claire, her family, and her friends are going to get through it is if they can find a way to make it funny again. 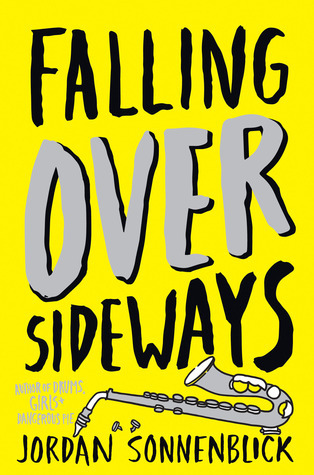 Falling Over Sideways was written by Jordan Sonnenblick and published by Scholastic Press in 2016. It’s funny, heart-breaking and captures what it’s really like for a family to cope with a serious medical issue. I found the story a bit slow at first, but sticking with it was totally worth it! Some parts made me tear up. The author has managed to include Claire’s struggles with her friends, as well as her feelings about her changing body, her dancing ability, and her place in her family. I liked the father-daughter relationship and I especially loved Claire’s voice. She’s funny and engaging. I felt like I really got to know her. This is a great example of a first person point-of-view. Claire is looking back and telling us what happened. I’d study this to see how to smoothly transition between events that happened in different time periods in Claire’s life. 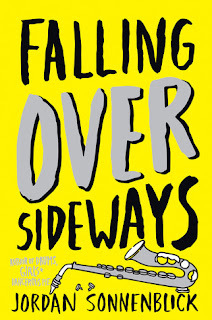 This is Jordan Sonnenblick’s first published novel with a girl narrator, but boys will enjoy it too (head ups – there’s some detail about periods in Chapter 2, which may be enlightening). It’s worth discussing how Claire’s perspective on life changes through the story. Two of Jordan Sonnenblick’s other middle grades are definitely on my list of all-time favourites: Drums, Girls & Dangerous Pie and After Ever After. Sounds like a good read. This book would have been good for my daughter growing up because sadly her dad went through many medical emergencies that she remembers. Some humor could have helped. I liked this one, too. The author did his research on strokes as I had a close family member go through this same ordeal in 2015. Glad you're back! I've read quite a few Jordan Sonnenblick books, including his YA novels, but I haven't read this one yet. Need to do that soon! He has a great sense of humor. I met him at an Eastern PA SCBWI retreat years ago. My kind of story. I love to share stories like this that are healing for readers. Will check it out! Jordan Sonnenblick is particularly good at titles! I haven't read him yet; think I probably ought to. I do warn the boys just to get through the first chapter without mentioning details. Sonnenblick was on point with this, but I could have done without it. As always, adore his writing.